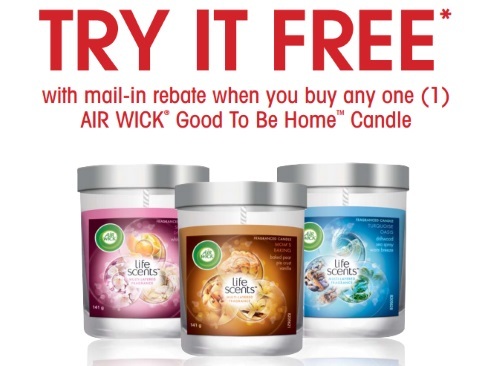 Air Wick has a new mail-in rebate! Get a Free Good To Be Home candle when you buy and mail-in the rebate below! You will get up to $10.40 back to cover the cost of the product and taxes by mail. Limit 1 rebate per individual, family or household. . Purchases must be made between January 25-March 4, 2016. All requests for rebates must be received on or before April 4, 2016. Offer valid only in Canada. Only original rebate forms and original dated cash register receipts with the UPC code recorded will be accepted. Click here for the mail-in rebate form.